How very sad. Beyond sad, actually, quite depressing. 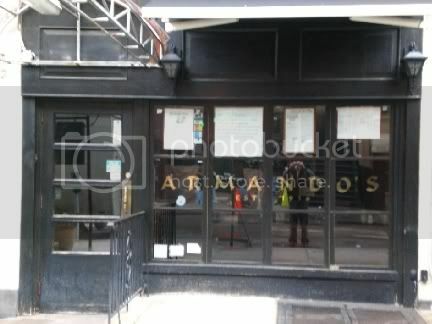 One of my favorite restaurants in my neighborhood has gone out of business after 72 years. 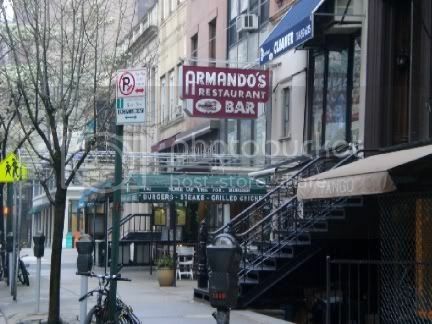 Armando's was the first restaurant that I ever ate at in this neighborhood, back when I was still living in Manhattan. It has remained a favorite over the years and I generally eat here at least once a week. The Mysterious Chinese Woman and I were planning on eating there last night as well when, to our dismay, we found it had closed. 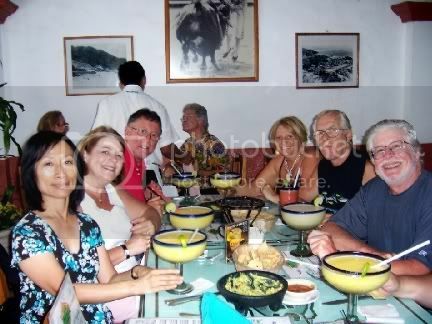 It closed on March 16th while I was in Puerto Vallarta so I hadn't seen anything about it closing in any of the papers. It might have been big news in Brooklyn, but not in Mexico. We actually just stared at the darkened windows in stunned silence, not really believing what we were seeing. Really, this was like losing an old friend. We always felt like family in here and now I don't even know where the bartender has gone. Hopefully I will be able to track him down and visit him at his new place of business. 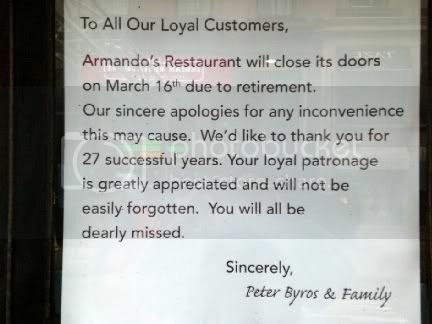 Apparently the current "owners" of Armando's have decided to retire after 27 years. I wonder if increasing rents had anything to do with this decision. 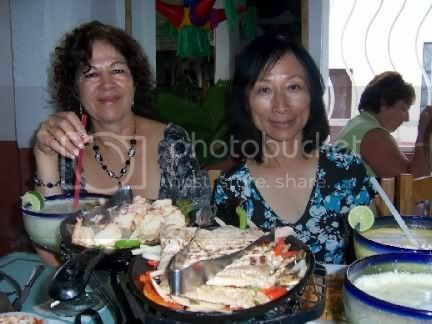 The restaurant always seemed to do a good business, both at lunch and dinner. 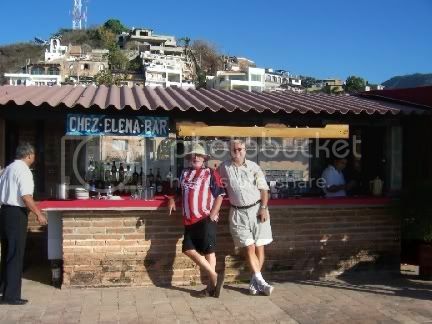 The bar had a regular crowd too. I think I am going to cry. The place had a lot of history behind it that will now be gone for ever. Supposedly Marilyn Monroe and Arthur Miller used to dine there and it was also frequented by the Dodgers back when they were the Brooklyn Dodgers. Norman Mailer was also a regular. 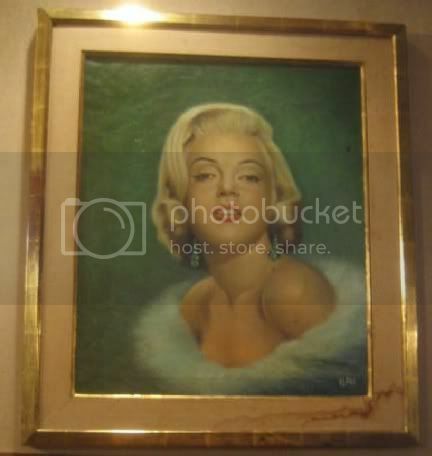 Never again will I be able to dine underneath the picture of Marilyn. In just a few short months Spicy Pickle, a Denver based sub franchise, will be moving in. Not too long ago the Five Guys hamburger chain opened up a place across the street. 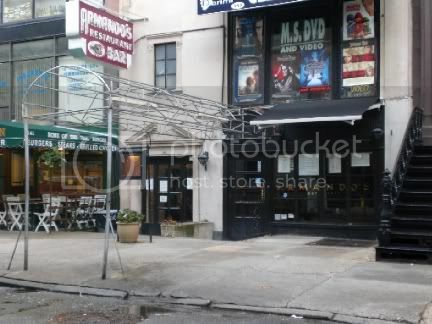 Montague Street used to be full of neighborhood restaurants, but the times they are a changing. And, in my opinion, not for the better. No matter how good Spicy Pickle may be, it will never be Armando's. I think I am going to go back to bed now and pull the covers over my head. 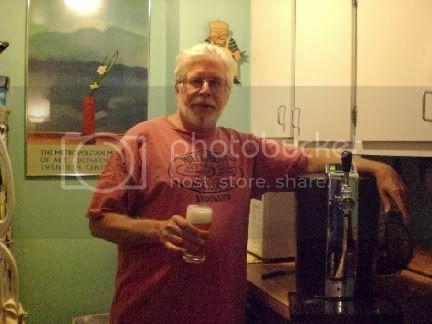 Oh, but first I will draw a beer from my new BeerTender. I may not leave the house for days. On a brighter note, we did end up eating at Pete's Waterfront Ale House last night and that was comforting. The food was great, as usual, the bartender and waiter were old friends, and the manager, Sam, gave us a complimentary after-dinner Apple Pie. This is a house specialty made by macerating apples, pears, cinnamon, and other secret spices in vodka. Quite delicious and packs a wallop. Thank goodness for Pete's, we really needed some comforting. Well, not really my very own bar, but at least one of the accouterments. You may recall that I have previously posted about Heineken Premium Light in a bottle (not too impressed) and the Heineken DraughtKeg (quite impressed). You may recall that I brought the DraughtKegs to a couple of Jets games and they were very well received. You do have to pre-chill them for about 5 hours or so but then they are good to go. 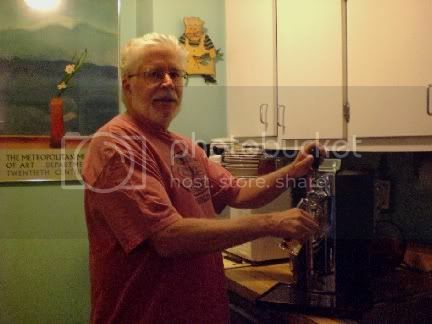 No pumping required and, supposedly, they keep the beer fresh and ready to pour for up to thirty days. I say supposedly only because I have never had a keg hang around that long, particularly a five liter keg. But now my chances have increased. 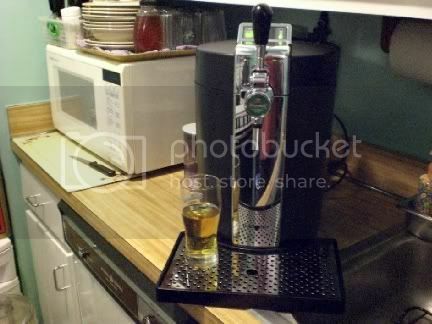 Recently I received a BeerTender made by Krups just for Heineken. I wish they would have had these when I was in college. You can see by comparing it to the microwave in the background that it is fairly small and even fits into my relatively tiny kitchen. 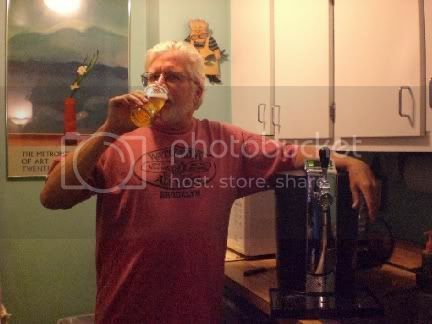 You either put a warm keg or, to quicken the process, a pre-cooled one into the BeerTender and plug it in. It keeps the beer at just the right temperature and you can pull yourself one anytime you want. You could probably put one of these in each room of your house. Just like with any keg your first pull will be largely foam. 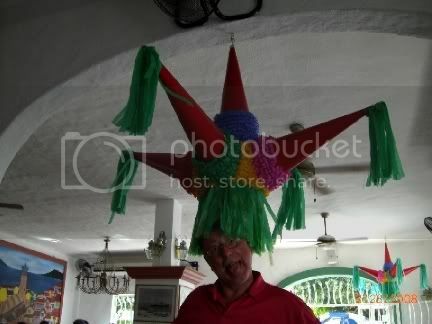 Heineken is a somewhat heady beer so you always have to be a bit careful. One trick, rinse your glass with cold water first. This will cool the glass and the remaining water (don't dry the glass) cuts the foam. There are a few quirks, but they aren't too bad. The biggest drawback is that you need to affix a one-use BeerTender Tube (they aren't reuseable). You can order them at www.beertender.com and they cost$3.99 plus shipping and handling (don't know how much that adds up to) for ten. That could be an issue, particularly if you run out. One thing that confuses me. I saw an add for tubes that would allow you to use this with beers other than Heineken. However, in the manual it says "Only a Heineken DraughtKeg and Heineken Premium Light DraughtKeg can be used with the BeerTender. " I think that if you can, indeed, only use this with one brand of beer it is a major drawback. I realize that other beers that sell in 5 liter kegs don't really stay fresh for more than a day or two. This means that one of the advantages of the BeerTender, keeping the beer cold for up to30 days, wouldn't be relevant. Still, it would be kind of neat to put a different beer into it every once in a while for a party or something. But on balance it is a pretty nifty little gadget. Not cheap though, about $279 for my model, the B90. There is a B95 out now too that sells for $299. The primary differences are that the B95 has a thermometer as well as in indicator light. You can see the actual temperature and the indicator light tells you when it is ready to drink. Also, you can set the temperature of the BeerTender to one of three temperatures, 36, 39, or 42. There is also a freshness indicator that counts down from thirty days after you insert a new DraughtKeg. Hmm, five liters and thirty days to drink it, I don't think I need a countdown indicator. The BeerTender is kind of dangerous though, it just makes it too easy to pour yourself a glass of beer whenever you feel like one. In fact, I just did that. Although you can see roughly how much beer you have left in your keg from the indicator light, it only indicates by the quarter keg. However, when there are only about two glasses left the light starts to flash so you know you need to get another keg ready. I thought this was a somewhat nifty feature in a somewhat strange way. One day a bunch of us decided to go to Pipis for lunch and drinks. This is a well-known restaurant and a bit on the touristy side. 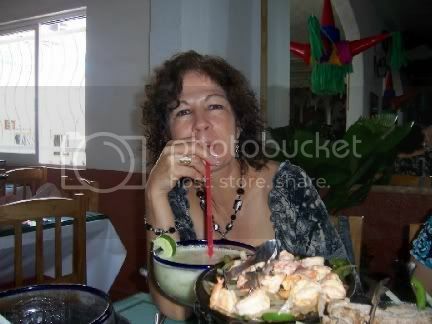 The food is decent and plentiful, the drinks are huge, and the guacamole that they make at your table is excellent. What's not to like if you are just kicking back. As you can see, they are not shy about advertising their presence on the corner of Pilila and Guadalupe, just a few blocks back from the bay. 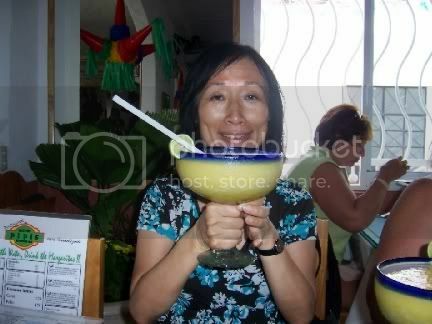 Oh, and did I mention that the drinks were huge? 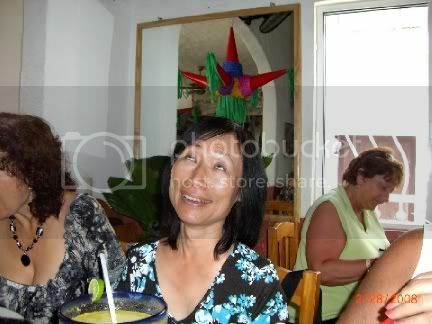 From the look on her face, she seemed to think it tasted pretty good. Elba, aka Bella, also seemed to be enjoying hers. And Chris and I joined in the fun as well. The food here, as I mentioned before, is quite plentiful. 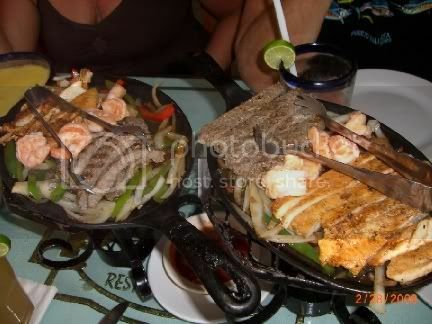 We all opted for the fajitas and were not disappointed in the least. As you can see, we had quite a crowd. This picture must have been taken just before Elba showed up. 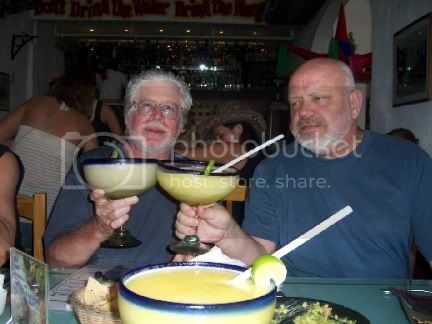 I didn't think the drinks were particularly strong, but Dennis seems to be proving me wrong. We had a merry old time and when it was over we headed out to find some more. 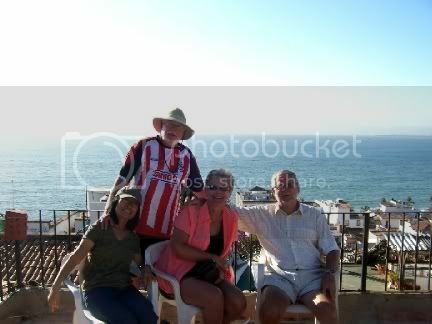 Stay tuned for pictures of Elba and Tom's wedding which took place a few days after our lunch here. Although I am back home in Downtown Brooklyn where the weather is still gray and the people all dress in dark colors, I still have a backlog of things to post about from Mexico. It kind of warms me up a bit when I do so and get to look at the pictures. again. This is not the easiest place to find. It is several blocks back from the bay and more than a bit of a walk uphill. It sits atop a hotel and restaurant and offers some spectacular views of the bay, the city, and what little of the mountains you can still see. You can see how this is a great place for a sunset drink and is well worth the time it takes to find it and the effort it takes to get to it. If you look to the south you can see the part of Puerto Vallarta where we stay, although we are on the other side of the Rio Cuale. The church tower of Cathedral of Our Lady of Guadalupe used to be visible from the living room window in our unit. It is now, sadly, blocked by a new building that is going up. 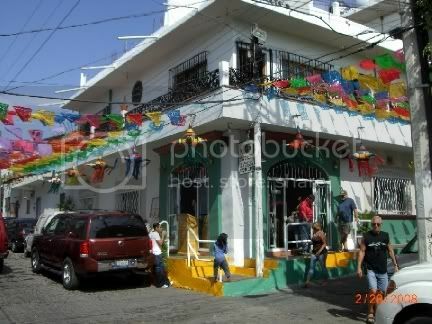 The large structure that you see is a huge condo that is going up right on the south bank of the Rio Cuale. To build it they tore down a lovely old colonial style hotel that had a nice outside bar, a pool with a waterfall, and a bunch of parrots. 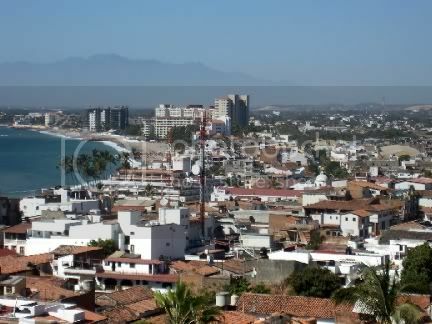 I guess there is no stopping progress, but it is somewhat sad to see much of the old Puerto Vallarta disappearing. 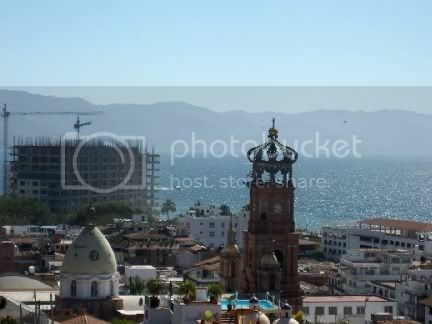 As you can see, Puerto Vallarta is sprawling to the north as well. Just a few short years ago the area where you see the new buildings was largely marsh and home to salt-water crocodiles and other wildlife. 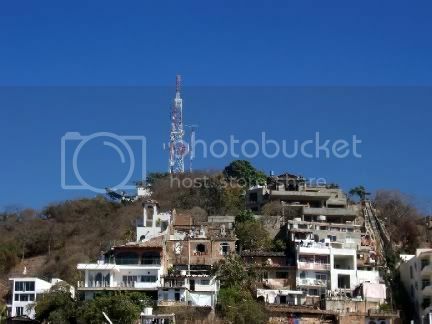 Similarly, more and more homes are being built up the mountains surrounding what was the old Puerto Vallarta. Well, maybe not mountains, but certainly foothills. Just a few years ago there were only maybe one or two small houses on that hill underneath the antenna. I thought that last shot made a good backdrop for a group photo. 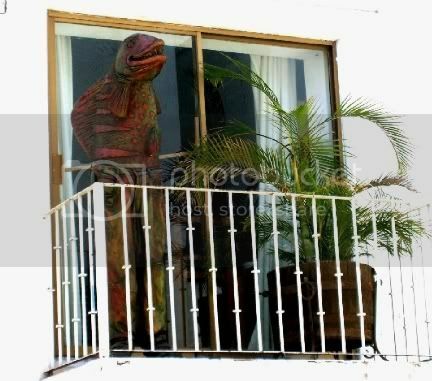 I also think I found out where the Creature From The Black Lagoon decided to retire. I suspect that his money goes a lot further down here, and he is close to the water. 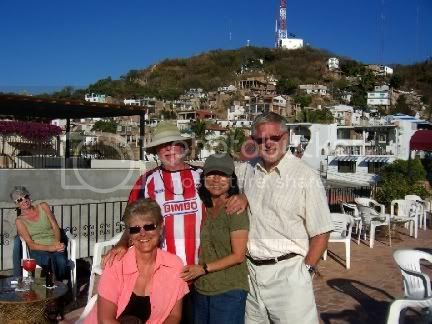 Puerto Vallarta has always been popular with the movie crowd. It looks like he has been getting a bit of sun.